Titania Takes a Quantum Leap. It’s with tremendous pride that I announce, my award winning costume installation, “Titania Takes a Quantum Leap”, has been selected to be a part of the Venice Art Biennale. “Titania” is a multi media installation featuring alternative fabrications and LED technology. It was originally presented at the “Creatures and Models” conference in San Francisco, California. This juiced exhibit was sponsored by LucasFilm and judged by the senior art department heads at Industrial Light & Magic studios. 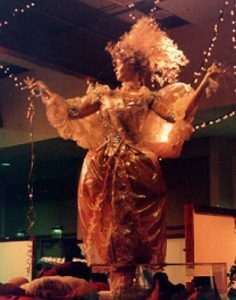 “Titania Takes a Quantum Leap” was awarded Best in Category (Costumes) and “Best In Show. “Titania” was also selected to be exhibited at the “Brave Destiny” group show at the WAH Gallery in New York City along with the works of Robert Venosa and Alex Gray. Now “Titania” will take another “Quantum Leap” across the Atlantic where she will be a part of the prestigious Venice Art Biennale as a part of the “It’s Liquid” Group. Would you like to know more about this Art Piece? Would you like to learn more about the Venice Art Biennale?